I’ve never much cared for haggis (I blame this on the time Grandma B got a bit excited on a trip to Scotland, bought a haggis home and made us eat it even though it burst in the boiling process and was runny as well as being made from the most revolting bits of animal). Anyhow that was a long time ago and Nigel Slater was kind enough to put a recipe in the newspaper for a Burns night compromise. Nigel seems like a very nice person and therefore didn’t actually call it “chicken with a haggis up its arse“. I’m not saying that Sir S (! ), my brother (Uncool P, as he is fondly known by Missy B), Jenny and I are not nice people, but that’s what we’re all calling the dish henceforth. I got my neeps and tatties from Borough Market on the way to work and compared notes with the lovely lady at one of the fantastic greengrocers there. She was going all traditional, with the haggis and mashed neeps and tatties. She liked the sound of Nigel’s suggestion though and I LOVED this recipe – not only was it spectacularly tasty, it is feasible to get it on the table at a reasonable time after a day at work. I did make the haggis stuffing the day before, which helped, but that doesn’t take long either. And once the chicken is in the oven, there’s plenty of time to go and slip into your finest tartan. You can just see from the picture above that Uncool P sort of did that. The sliced neeps and tatties were succulent, just cooked in a little olive oil with some thyme, with the chicken on top. 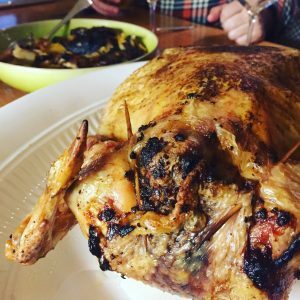 The chicken, from the excellent Hampstead Butcher, was perfect, tender and beautifully complemented by the haggis stuffing, which was a revelation to me: not at all runny and very delicious. 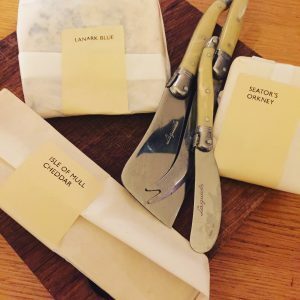 I’d popped into Neals Yard Dairy and had a little taste of all their Scottish cheeses, chose three. The cheddar went down particularly well with the guests and I loved the Seator’s Orkney. Put the oatmeal and sugar in a small pan and heat gently until the sugar is dissolved and the oatmeal is golden and caramelised. Concentrate – the first batch burnt (or get someone else to do this for you – thanks Uncool P). Crush half the raspberries with a fork and stir in the rest of the raspberries. Spoon layers of raspberries, cream and oatmeal into wee glasses. Oh and to get the evening off to a totally unScottish start, we began with Gloria Swanson’s champagne cocktails. There was a reason for this, related to Jenny’s forthcoming exciting project and a comment by Uncool P about a pheasant recipe. Apparently Gloria liked to start her day with a glass of this fine mix of champagne and cognac, with a twist of lemon and a couple of ice cubes. Seems like a damn good idea! i love Cranachan. I hope Sir S realises that the opening of the single malt was absolutely essential for this delicious pudding. Oh and who is Gloria? She sounds like my kinda gal. If my beau had been with me I would have been able to say that this was my FAVOURITE BURNS NIGHT EVER. Only his absence prevented it from being so. Absolutely fabulous food. The chicken with a haggis up its arse was GENIUS and I’m going to pinch this idea, even when it isn’t Burns Night. 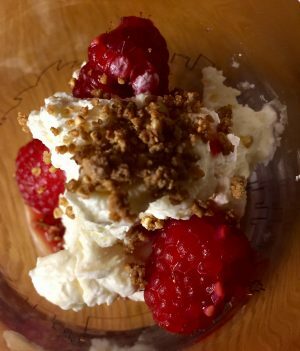 Mmm and the cheese… MMM and the Cranachan. This will probably be my Burns Night menu every year from now on instead of the haggis pizza!